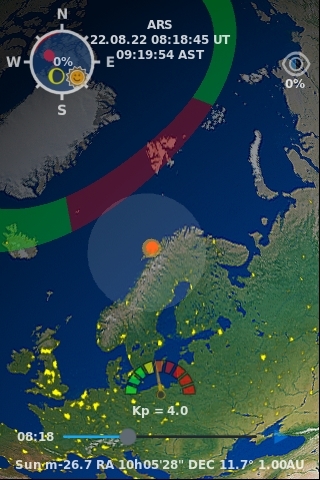 Land-based observers in Svalbard will experience at most 2 minutes and 28 seconds of totality and about 6 seconds less in the Faroe islands, provided the weather is good enough. However, at 49,000 feet (14,935 meters), this eclipse flight will fly in the lower stratosphere over any potential cloud systems and add over a minute and twenty two seconds of totality! The totality duration will be of at least 3 minutes and 50 seconds, and pushing the aircraft to its maximum speed (Mach 0.90) would let us reach four minutes. No other commercial or private flight will surpass that duration or the cruise altitude during this eclipse, and this passenger flight will be the highest yet during a solar eclipse after the ones of the Concorde in 1973 and 1999. 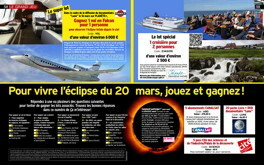 There is also an opportunity to give a wink to Don Connolly’s famous painting of the Concorde 001 and the black Sun, as other commercial eclipse flights flying at least 12,000 feet below us, and to the west, will see our private jets streaking the dark sky near the eclipsed Sun surrounded by its corona. 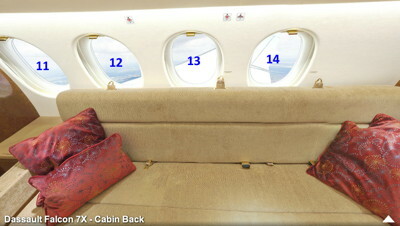 Only 10 seats will be sold on this exceptionnal flight, so hurry up to reserve yours. A visit of the aircraft is planned the day prior to the flight, so that the participants have a chance to make minor adjustments to their setup. After our eclipse flight, we will visit the exhibit in which the Concorde 001 used during the 1973 eclipse is on display. More information there. For the participants it’s also a nice opportunity to spend a few days in Paris. Use of this simulation is strictly forbidden without my written approval. All commercial uses are subject to a fee for every planned flight. no wind (so ground speed equal to air speed, and heading equal to course). Detailed pre-eclipse flight planning, and in-flight execution, will incorporate and allow for the full range of possible flight levels, air speeds (up to Mach 0.90 or 515 knots), and wind-vectors that may be encountered in flight to re-optimize the Totality Run in situ as may be necessary or desired. We define the baseline Totality Run such that the aircraft is centrally located at the apex of the lunar umbral shadow (but corrected for the irregular lunar limb profile) at the topocentric instants of Maximum Eclipse at the chosen intercept point. 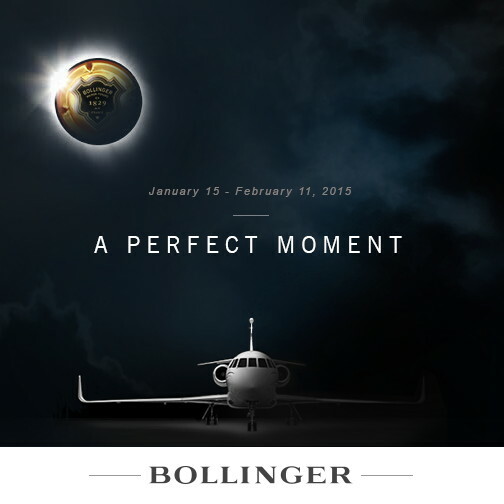 We also define the baseline Totality Run so that the aircraft velocity vector at mid-eclipse places the Sun perpendicularly to the right-side windows of the aircraft passenger cabin to provide optimum out-the-window viewing and utilization. This orientation also provides an optimal orientation to prolong the duration of totality to a theoretical maximum anywhere along the path of totality by using the aircraft’s speed to partially keep pace with the lunar shadow. With these constraints, we compute, and tabulate below, three key time correlated waypoints for the totality runs that define the lunar shadow intercept and crossing by the aircraft designated C2 (eclipse second contact), MAX (corresponding to the UTC instant of maximum eclipse), and C3 (eclipse third contact). MAX, in both time and position, will depend upon the aircraft altitude AMSL. C2 and C3 will also depend upon the aircraft ground speed and track (i.e., airspeed and winds aloft). The earlier start of the pre-totality outbound leg of the Totality Run is to be defined by a pre-totality time-correlated waypoint fourteen minutes before mid-eclipse. The aircraft is initially positioned on the MAX-eclipse intercept track at the requisite course/heading, distance, and flight-time from the intercept point allowing for airspeed adjustment in the run up to the C2 time-correlated waypoint to compensate for deviations due to actual versus predicted winds aloft (holding the MAX intercept time-correlated waypoint invariant). After C3 the aircraft will remain on the MAX-to-C3 heading for six minutes following mid-eclipse to allow viewing of the recession of the Moon’s shadow before returning back to Paris. The baseline flight plan presented here is of sufficient fidelity for the presumed nominal parametric conditions assumed that, if rigorously followed, will successfully result in a highly viewing-optimized and geometrically precise time-correlated mid-eclipse intercept with the aircraft concentrically located along the apex of the lunar umbral shadow cone. However, all timings and correlated locations, and maps presented here are valid only for the specific set of baseline assumptions used here and shouldn’t be used elsewhere. Later recomputation of the eclipse observation plan (and thus to a small degree end-to-end) flight plan, is expected and anticipated. The Totality Run (TR) is entered nominally at the completion of a heading re-alignment maneuver with a constant radius turn onto the TR track at the requisite UTC time, location, altitude, TAS, and heading. Once on the TR track, before the start of totality at C2, small adjustments to the aircraft speed may be made to compensate for winds-aloft or turn-exit navigation errors to maintain the desired mid-eclipse flight profile. Flight scenario: totality run at FL 490, Mach 0.83 (TAS 475 kt). Outbound and inbound legs at FL 450, Mach 0.80 (TAS 460 kt). 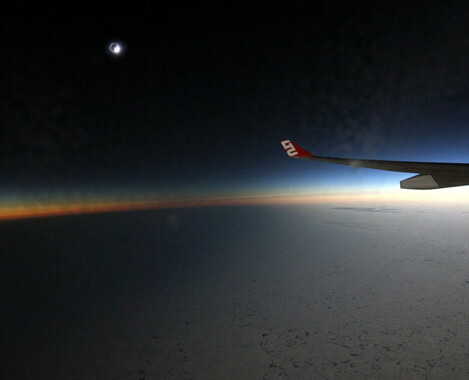 Notes: (1) Totality run to place the Sun "straight out" the main cabin windows at mid-eclipse. (2) No statistical (i.e., anticipated seasonal average) wind vectors have (yet) been assumed. (3) Constant radius turns onto/off the TR track assume a bank angle (and thus derived turn radius/duration) of 25°. (4) Ascent and Descent profiled durations and ground-track distances are to-be-verified. (5) Geodetic coordinate reference frame is WGS84. (6) ΔT: 67.8 seconds (current IERS derived prediction for March 2015). (7) Local time in Paris is UTC+1, that is 8:22am for take-off and 12:55pm for landing. 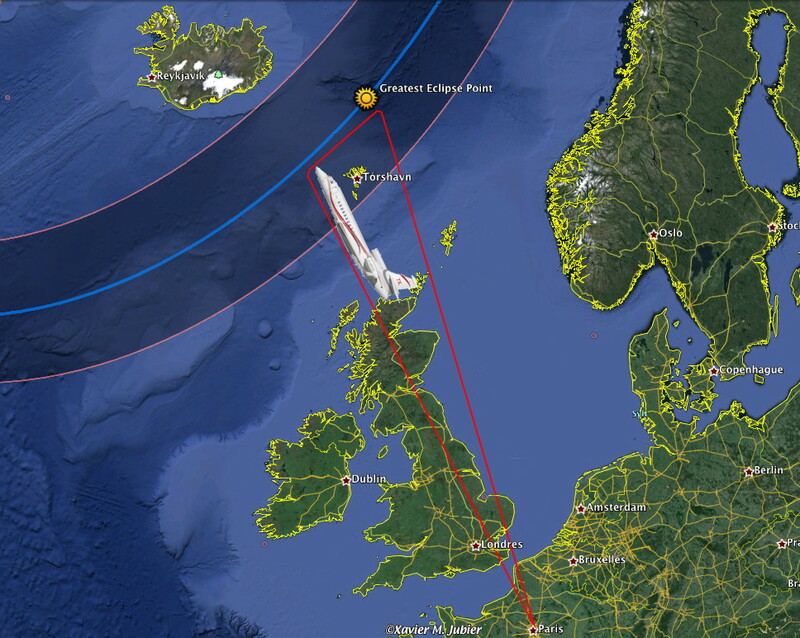 (8) After the eclipse a technical stopover may be required in either Aberdeen in Scotland, Vágar in the Faroe Islands or Reykjavik in Iceland. (7) Local time in Geneva is UTC+1, that is 7:45am for take-off and 1:20pm for landing. To mitigate against the operational possibilities of a "time-critical" take-off delay from LBG for any reason, an earlier than time-critical wheels-up time for a central intercept at the chosen mid-eclipse intercept point is planned. This is 10 minutes. Choosing a private airport does help somewhat to reduce those potential delays. The climb phase of the flight must be defined in detail by the aircraft flight planners and air traffic can have an impact. For initial planning we have an estimated climb to FL 450 consuming 17 minutes of time and covering 127 nautical miles. 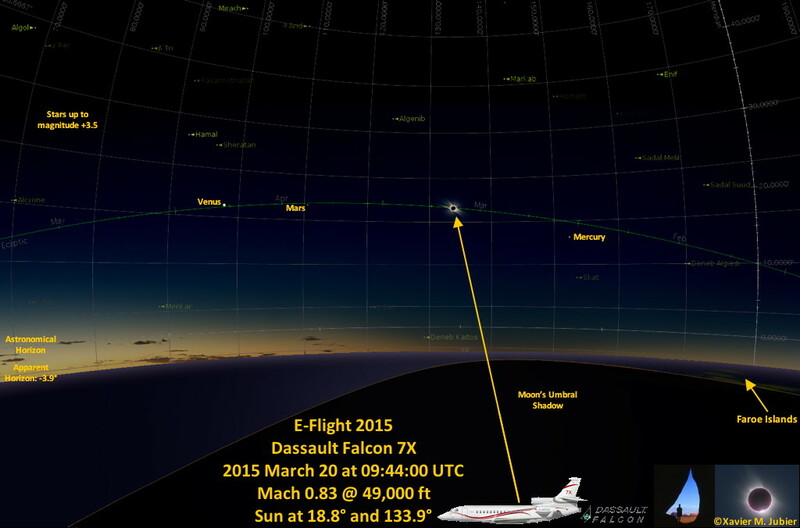 A "most economical" TAS cruise speed of Mach 0.80 is used for initial planning. This, importantly, provides some leverage to invoke higher or lower cruise speeds (up to Mach 0.90) to allow mitigation against unfavorable head or tail winds that would otherwise result in a too-late or too-early arrival at the TR start point, or during time/position decorrelation during the TR itself. Performance options that may be invoked are to be discussed with the flight crew and operations planners. In the event of an on-schedule earlier than time-critical, take-off, the "extra" time programmed into the flight plan to otherwise compensate for a delay must be consumed by either maneuvering enroute (executing a loop for example), and/or flying at a slower TAS to the time-critical TR start point. This is a detail of the flight planning that will necessarily worked in concert with the flight crew and flight planners (given airspace and other operational constraints) at a later date closer to eclipse time. Implementation details will be worked later in the final planning with the pilot in command and flight planners. Repositioning the heading re-alignment maneuver following the outbound cruise phase can be done in situ using my Solar Eclipse Maestro E-Flight eclipse flight optimization and navigation software. Lets now see why this intercept location was chosen. The track, geometry, and location of the path of totality, and the time-correlated UTCs of key eclipse events (e.g., start, end, and middle of totality) that ultimately constrain an end-to-end eclipse-observation flight plan, as seen from a moving aircraft, will depend in detail on the aircraft altitude above mean sea level and its velocity vector (ground speed and direction) as modified by winds aloft. Baseline (Phase 1) eclipse-flight planning, as discussed and presented here, makes assumptions for later (Phase 2) optimization and refinement within constrained margins with dependencies on in situ conditions that may be parametrized in final computations. A baseline flight plan is developed to provide a framework to be refined for an executable flight mission subject to refinements and constraints levied by aircraft performance and operations factors. Phase 2 "fine tuning" of the flight plan (e.g., in light of statistically anticipated and actual winds aloft) is later expected. We designate a "Totality Run" (TR) as the portion of the flight devoted to the observation of the total phase of the solar eclipse. The Totality Run is planned so the aircraft has assumed straight-and-level flight at constant speed at and throughout the totality and during pre/post flanking intervals closely prior to and after totality. The point (time correlated location and UTC) of "Mid-Eclipse" (ME) intercept is the instant at which the aircraft is concentrically located in the Moon’s umbral shadow. 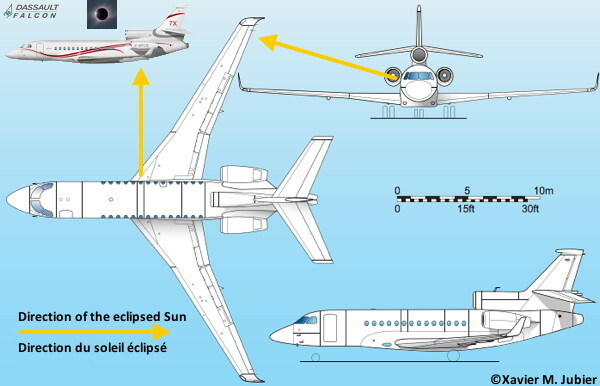 The Totality Run is planned so the aircraft heading is the solar azimuth at mid-eclipse minus 90 degrees, so the Sun will present itself "straight out" to the sun-side passenger windows. This is the right (starboard) side of the aircraft, so enabling an aircraft velocity vector component in the velocity vector of the Moon’s shadow with a resulting increase in the duration of totality as seen from the moving aircraft. 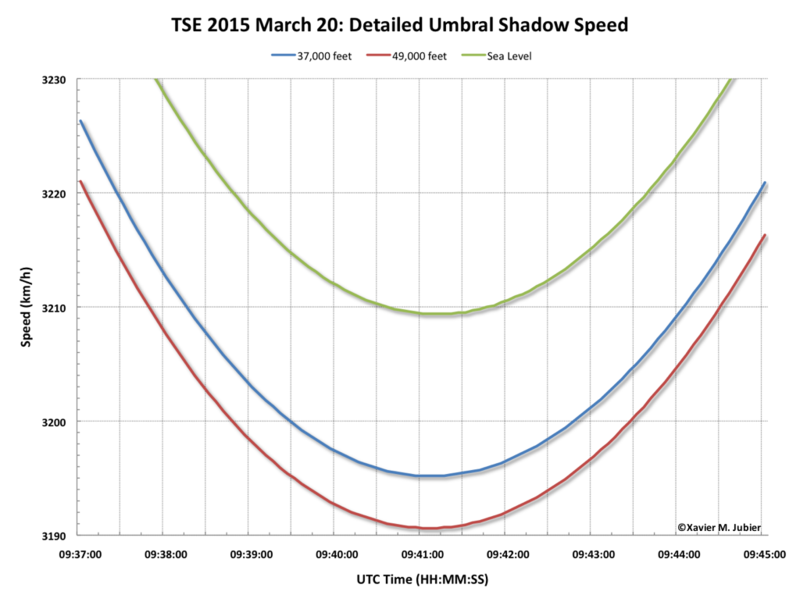 All this leads to select a location where the Moon’s umbral shadow velocity is the lowest (see graphs below), that is generally close to the middle of the totality path, to prolong totality with an aircraft moving in the direction of the lunar velocity vector. 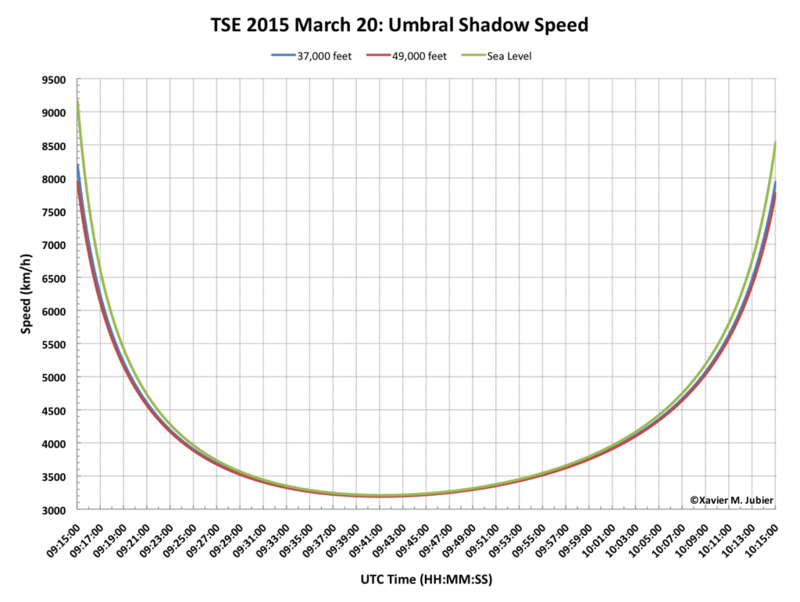 One can notice how fast the Moon’s umbral shadow is moving, even at its lowest speed. No current commercial aircraft can match this speed of about 3,200 kph (1,988 mph). The Concorde 001 in June 1973 is the only aircraft in history that managed to briefly keep up with it. 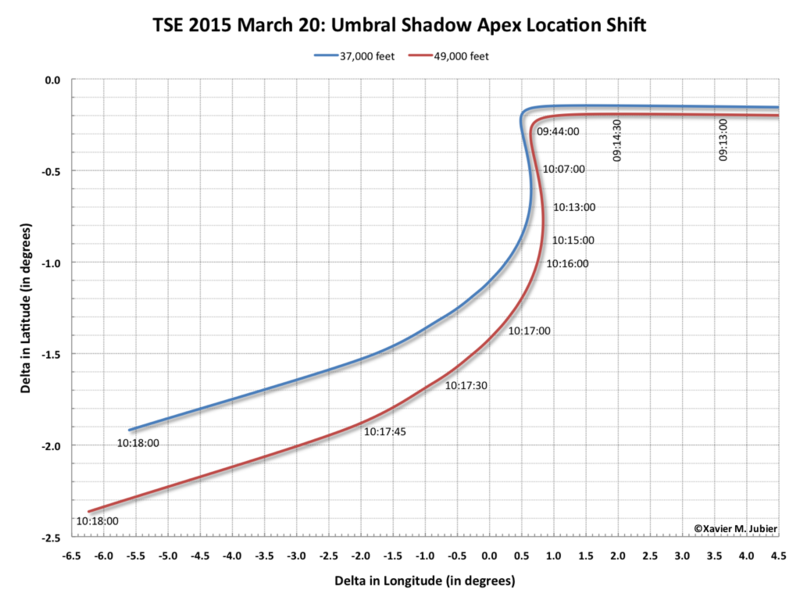 The detailed graph shows that the Moon’s umbral shadow velocity changes with altitude, which is why it has to be computed for the specific altitude of the eclipse flight. 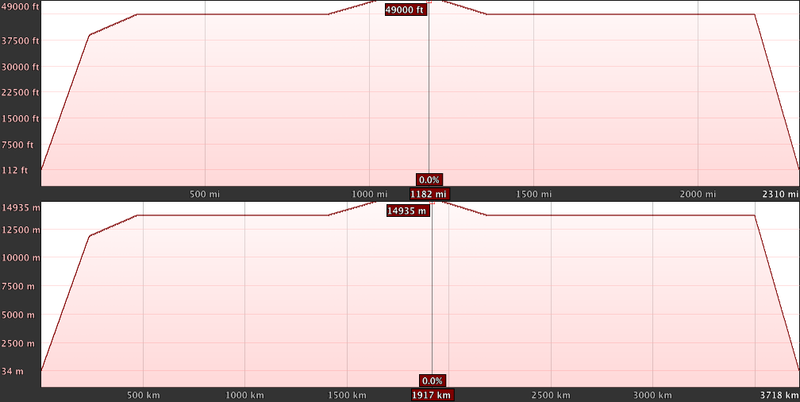 different flight level to the limit of the service ceiling with trade of achievable ground speed. Such parametrically defined variations to the baseline flight plan, subject to aircraft operational and performance constraints, will be reviewed and discussed with the aircraft flight operations and planning personnel, and are readily (re)-computatble as needed with my Solar Eclipse Maestro E-Flight eclipse flight optimization and navigation software. The time-correlated position (centerline track) of the Moon’s umbral shadow shifts in latitude and longitude with topocentric altitude AMSL. This graph shows the difference in centerline topographic coordinates at 37,000 and 49,000 feet (11,278 and 14,935 meters) compared to sea level over the time. One can see again that the choice of an intercept at 09:44 UTC is completely justified. Because incoming cosmic radiation particles are deflected by the Earth’s magnetic field, the intensity of in-flight radiation is a function of both altitude and latitude. In general, radiation shielding by the geomagnetic field is greatest at the equator and decreases as one goes north or south. At typical commercial airline flight altitudes, the difference between the cosmic ray dose rates at the equator and at high latitudes is about a factor of two to three, depending on where one is in the approximately 11-year solar cycle. During a solar eclipse the intensity of those cosmic radiations doesn’t increase: in fact the particles flow emitted by the Sun stays the same, while on the other hand the Moon acting as a shield for up to a few hours would even reduce the intensity reaching Earth’s atmosphere. Of course, your total exposure will be a function of the hours you spend at altitude. In any case, your annual radiation burden will be well within the limits considered acceptable for occupational exposure by such organizations as the ICRP. For our 5-hour eclipse flight at 49,000 feet (14,935 meters) during the totality run and 45,000 feet otherwise, passengers can expect to receive about 45µSv, when the maximum permissible dose over one year is 1mSv, that is 22 times more. However depending on the solar activity during the days preceeding the eclipse flight, the dose received can greatly exceed the 45µSv and even reach 450µSv if a coronal mass ejection occurred directly towards the Earth in the days leading to the eclipse flight. This is a very unlikely event that would create huge northern lights; usually the coronal mass ejections aren’t aimed straight at Earth, nevertheless it can happen on an occasional basis mainly during the maximum of the 11-year solar cycle. However, up to a couple of days are required for the particles to reach Earth, so this leaves plenty of time to amend the flight plan should it be necessary. 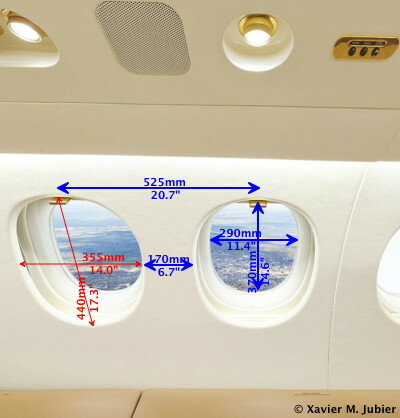 Flying at a lower altitude would reduce the radiation dose at the expense of the seeing quality particularly in the infrared; nevertheless even at 37,000 feet (11,278 meters) the dose would be around 30µSv and up to 300µSv. 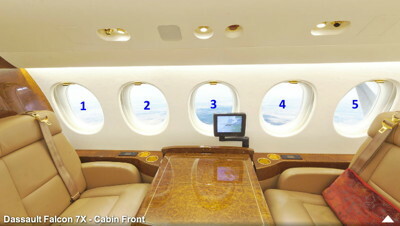 It’s worth to know that business jets fly on a regular basis at 45,000 to 47,000 feet. For your information, the pilots and crew are allowed up to 20mSv per year, or 100mSv accumulated over 5 years. Exposure to the cosmic radiations will be monitored by means of dosimeter badges or other equipment. At 49,000 feet (14,935 meters) you’ll receive about 12.5µSv per hour (data computed using the CARI-6 software used by the FAA) and we will stay at that altitude for less than half an hour. There are multiple reasons to explain why we fly at 49,000 feet (14,935 meters): first to have the darkest and most transparent sky, second there is less turbulences, third because of the atmosphere filters the near infrared wavelengths (see the above atmospheric electromagnetic transmittance graph) at which some experiments onboard will operate. The rainbow indicates the visible light wavelengths, the infrared wavelengths being on the right of the rainbow. 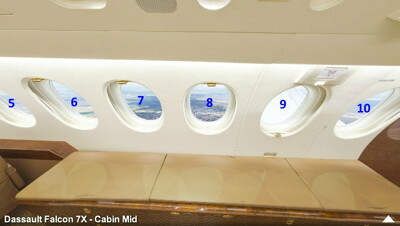 The windows are all identical in size and shape: 29 centimeters (11.4") wide by 37 centimeters (14.6") high. The inter-window spacing is 52.5 centimeters (20.7"), and 17 centimeters (6.7") between two consecutive edges. The usable field of view is 130 degrees approximately. 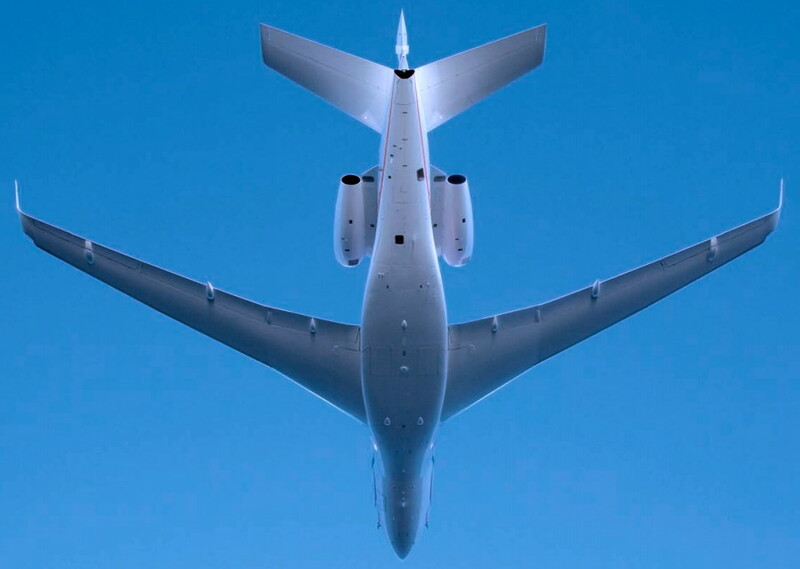 From the height of our private Falcon 7X, the apparent horizon is 438 kilometers (272 miles) away and is depressed by 3.9 degrees with respect to the astronomical horizon. Looking straight out on the Sun-side windows to the southeast at an azimuth of 133.9 degrees from true north, the black Sun will stand 22.7 degrees above the apparent horizon and 18.8 degrees above the astronomical horizon. From the aircraft you’ll clearly see the curvature of the Earth and the Moon’s umbral shadow extending near to the horizon with the Faroe Islands on the right-hand side. 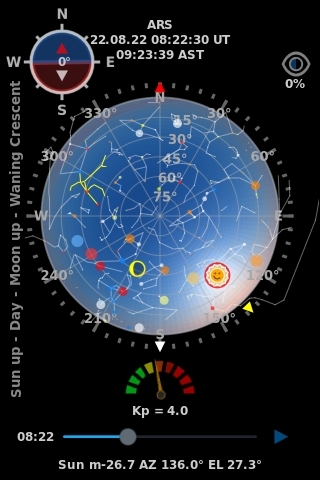 Stars brighter than visual magnitude +3.5 are shown where they will appear in the sky at mid-totality. The planets Mercury, Venus and Mars should all be visible as well along the Ecliptic. Venus will be visible to the naked eye several minutes before totality, Mercury likely shortly before totality and Mars barely discernable during totality. Although seeing northern lights during totality has never been reported, we do have a slight chance during this eclipse flight as the Sun’s solar cycle is still near its maximum and the auroral oval usually passes just north of our location when the conditions are right. 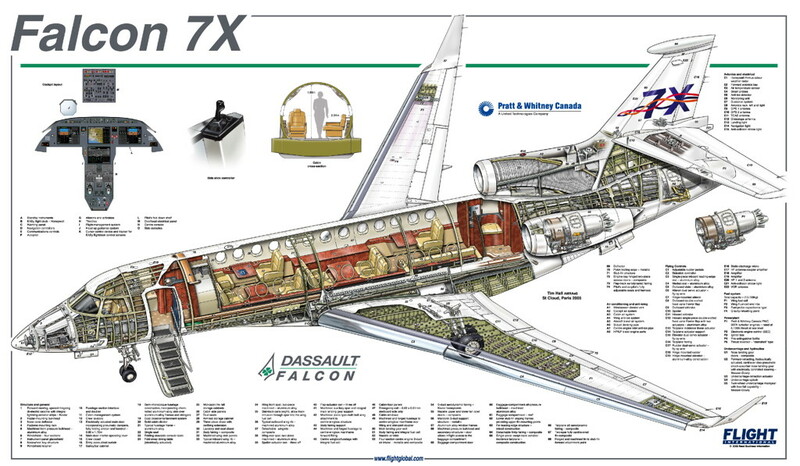 After our previous successful eclipse flight executed in November 2013 aboard a Falcon 900B and to provide the smoothest possible ride for our new adventure to totality into the lower stratosphere, only one private jet came to my mind: the latest Falcon 7X, from Dassault Aviation, having all the required operational capabilities as shown in these presentations and videos. Last page update on December 20, 2013.